Hi everyone! After a long absence, we’re happy to announce the return of TAG Movie 5à7s! Starting on Thursday February 8th, we will be hosting monthly screenings at the TAG Lab followed-up with “fan nights” where we discuss the games, books, and art associated with the film. Come take in a flick, chat with your TAG friends, and chow down on some free snacks! 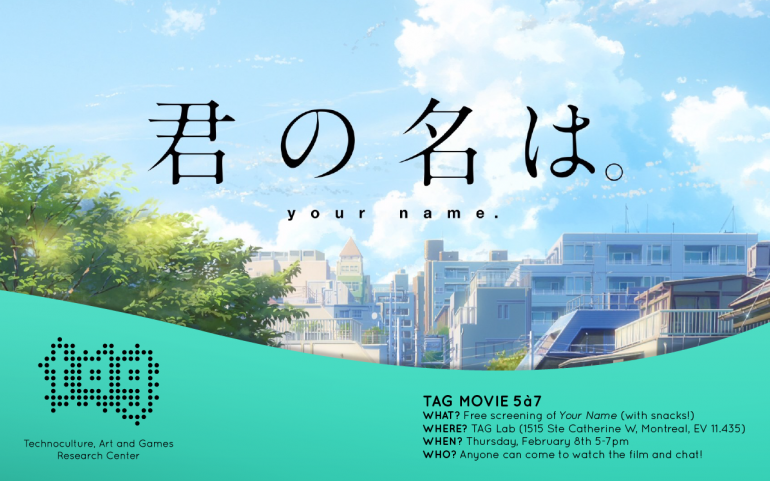 For our inaugural event, we’ll be screening the immensely popular Japanese animated film Your Name. Written and directed by Makoto Shinkai, Your Name is about a teenage boy and girl who embark on a quest to meet each other for the first time after they magically swap bodies.